Teams from Russia and Ukraine faced off online June 19, 2009. 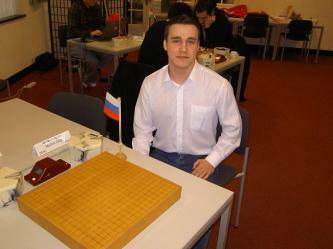 The games were held in the Russian Go Club KGS room. Time limits were 40 minutes main time plus 4 periods of 40 seconds byo-yomi for each player. Ukraine won over Russia 14 : 11. The result is not surprising. Over recent years a lot of strong Ukrainian players appeared on European Go scene. 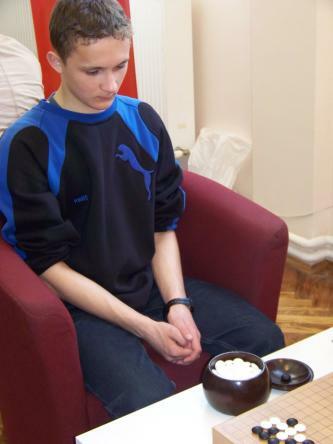 Ukrainian Go Federation invested in youth Go and the result was not slow to arrive. Artem won several times European Youth Go Championship under 18 years old. In Russia the situation is different. Russian sportsmen dominated in Europe in the last years but I don't see new rising stars. On KGS Russian top players are well known: breakfast, redrose, Diplomat, roln111 but there are no new names. In this game Oleg had a good perspective position but didn't manage to keep the game in his favor. Artem's counterattacks split black's groups and Oleg could not save them.